A small UK company that seems to have made some very interesting equipment, but not in any great quantity that I’m aware of. A bit of an oddity, this one. As yet, I know very little about it. I have been told that about 40 of these were eventually sold – some via Gemini (as the GM888?) and some direct. 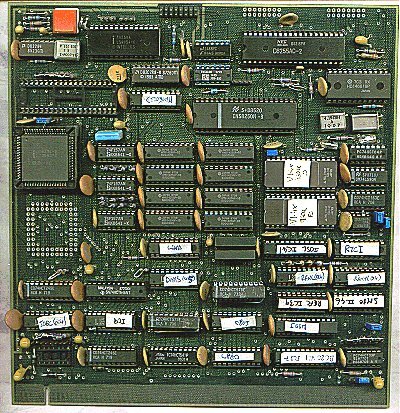 The card holds a 8088 processor with 256k RAM and its own BIOS EPROM. 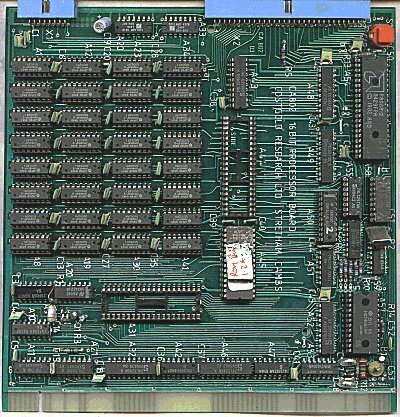 I presume that the larger of the two blue connectors carries a 16-bit bus for connection to other cards. However, if you look closely, there are two holes drilled through the board. One is at the left-hand end of the long connector and the other is to the left side of the bottom vertically-mounted ICs. Were these perhaps fixings for a daughter board? That is about it. I don’t even know what the missing ICs are. Please let me know any further information that you may have about these – I’m sure there are a lot of people who are just as curious about these as I am. If you thought that the CA802 was odd, this goes a step further! I have been told that they may have produced only four of them though. It forms an interesting link between the old NAS-BUS / 80-BUS and the modern PC. No Gemini number is known for this at present.